According to the Medford Police Department, Christopher Toppi, 28, of Cambridge, Massachusetts, turned himself into police last night in connection with an apparent homicide in Medford. 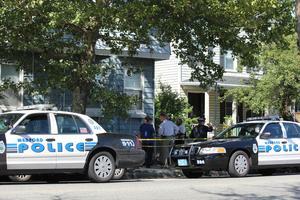 The victim, Brian Fahy, of Weymouth, was pronounced dead at the scene. Shortly after the Medford Police Department had sought a warrant for Christopher Toppi on the charge of Murder, Toppi turned himself in. He is being held at this time pending his arraignment in Somerville District Court for Murder. The Massachusetts State Police and the Medford Police Departments, which are leading this investigation, have not released any details regarding the incident, other than to say that they did not believe it to be random; that Toppi and Fahy were known to each other; and that the death appears to have resulted from a confrontation. Boston Criminal Lawyer Lefteris K. Travayiakis is an experienced criminal defense attorney available 24/7 to represent persons charged with Murder and other Crimes of Violence. To schedule a Free Consultation and to discuss your criminal case with a Boston Murder Lawyer, Contact Us Online or call 617-325-9500.